Sephiroth at that level with all of that Materia would destroy Hal. Hell, he might be able to defeat the Guardians at that level because he has the power of an entire planet behind him. Most ridiculously overpowered character ever, with the DragonBall Z characters not far behind. World War Hulk is also super intelligent, so a lot of the normal Hulk limitations don't exist with him. That being said, if the ring can figure out that the Hulk is powered by gamma radiation, he can absorb the radiation which would weaken the Hulk considerably. Now, the Red Hulk vs Hal would be NASTY. Not sure Hal wins that one. To be honest I don't know that much about the hulk, bit isn't red hulk powered by gamma also??? Oh, this is just silly. How is Hal winning? Nah, we'd just get Solar Hulk, or some damn thing. The Best Comic Site Ever!!! now i'll admit i dont know too much about the hulk, cause i've never been much of a comic book reader, more like an admirer of specific super heroes. (gasp). but isnt the red hulk also powered by gamma radiation? and thus hal could do the same with him? I see this being a stalemate until the cavarly arrives. Plain and simple, Hal isn't stupid enough to trade blows with Hulk. He would try to take him out from a distance. 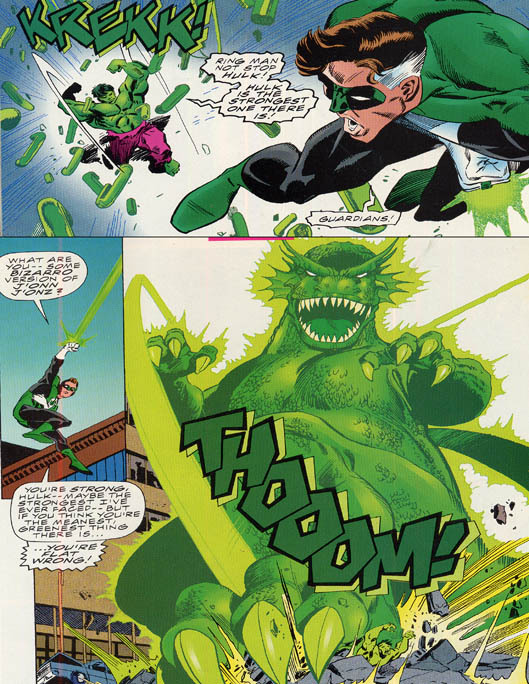 After Hal tries to trap Hulk in a bubble and he powers out due to his limitless rage, Hal would send for reinforcements where the rest of the GLC would contain Hulk. Lot of Hal bias in the poll. Also Rulk would probably be crushed by the green lanterns bubble technique. found off of a wikipedia page for red hulk "Everything the Green Hulk isn't, the Red Hulk is." Although possessing all the abilities of the original green Hulk, the Red Hulk does not grow stronger with anger - instead emitting increasing levels of heat." so hes out the window. with the original hulk, if Hal could stop the hulks schizophrenia he could reverse the transformation to smash bruce banner. Yeah, another easy way for any GL to take out a baddie: pry their mouth open, send a beam into their stomach, and enlarge it to the size of a house. Boom, dead. Ridiculously overpower maybe, but still insanely awesome. He has always been one of my favourite bad guys from any medium. Going by how these characters have been portrayed in the past, I think Hal's got the edge, but the Hulk has a good shot based on one principle - whether or not Hal is prepared for just how strong the Hulk is and how clever he actually can be. Even the "Hulk Smash" version of the Hulk has various ways to combat an airborn or long distance foe. (sonic boom hand-clap, his ability to close distances very quickly, etc.) if the Hulk can catch Hal off-guard and surprise him with the magnitude of his strength, he can take it. If Hal manages to correctly guage the Hulk's abilities, then his strategy will kick in and he'll come out on top. Only if Kyle is absent. Yeah, we've already seen Hal vs. Hulk. First issue Unlimited Access, 1999 I think. Or 98. Yeah, I'm going to go with Hal. Yes but like I said it's world war hulk so he can breath in space, although the hulk would lose all mobility and thus hal would be victorius. What was the result of the crossover fight? Ah thanks for clearing that up, I had heard that he could from a friend of mine who read the wwh issue. Apparently he lied a bit to help the hulk. Suffocation anyone? How would that even work? What would he be taking into his lungs in space? I'd go with Hal if he just realized the best way to fight is to hit Hulk from a distance and stay out of his reach. Hal Jordan, managing to keep his distance, gets the upper hand fighting the Hulk. Hal Jordan is about to deliver the killing blow when a red ring shows up and inserts itself onto Hulk's finger. Red Ring: "You possess great rage. Welcome to the Red Lantern Corps." Hulk, realising he can now fly, then smashes Hal Jordan into paste.